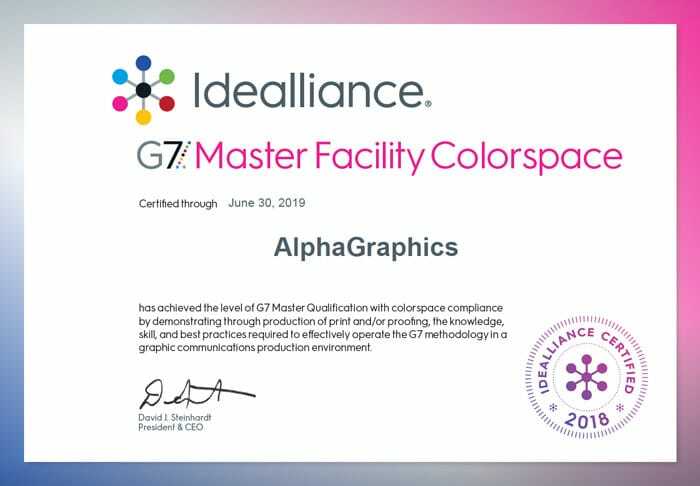 AlphaGraphics Seattle is happy to announce that we have once again achieved G7 Master Qualification from Idealliance. This allow us to manage consistent reproduction of your printed artwork across all of our production workflows. Idealliance is a non profit trade association. They are the leading authority on global print standards and the developers of the G7 methodology. G7 is a set of specifications for achieving visual similarity across all print processes. Being G7 Master Qualified helps us maintain our high quality standards. We pride ourselves on doing everything we can to ensure your projects are a success. This is our commitment to you.